Videos always give problems. There is always some setback that prevents you from playing your video on other devices because the video format is not compatible, or because the resolution is not adequate, etc. For example, the new iPhone X has a screen with a special aspect ratio (more elongated than the standard ratio) with which the videos show black stripes to fill the excess space. Most of these problems can be solved with dedicated programs, where perhaps the most complete is MacX Video Converter Pro, software that allows you not only to convert 4K videos on Mac but also to download online videos. The program is compatible with macOS High Sierra and supports many formats and codecs and have automated profiles (for iPhone X, iPhone, Samsung Galaxy S8 and more) to convert videos and thus match the resolution of each of them. One of the great highlights of this software is its compatibility with Intel QSV hardware acceleration and auto copy tech, which allow the conversion to be done in a way up to 5 times faster than other converters like HandBrake. Another feature that has been added in the latest updates of the program is the support for converting 4K video on Mac. 4K videos are extremely popular currently. You can record 4K videos with iPhone, Android or Go Pro or download 4K videos from YouTube. Therefore, the requirements of converting 4K videos are in great demand. And MacX Video Converter Pro is the solution to convert all types of 4K videos to common formats such as MP4, WMV, AVI, etc. MacX Video Converter Pro can also convert video to HEVC/H.265, the new codec that can be enjoyed on iOS 11 and macOS High Sierra. The video file size is reduced up to 50% after the conversion but no video quality loss. It saves lots of storage space. 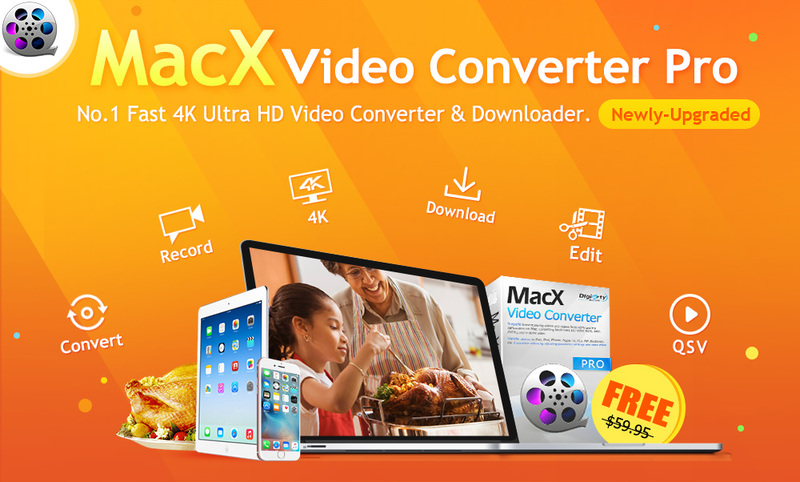 MacX Video Converter not only has a powerful video format converter, but also a built-in video downloader to download videos from YouTube, Facebook, Vimeo and another 300+ sites. 4K, HD, SD videos are all supported. You can even convert music video to MP3 to set them as the ringtone or background music. What’s more, the software also includes a complete editor with which to add watermarks, subtitles, cut videos, merge them with others, change the resolution … You can even create a photo slideshow with background music. And when you thought that it could no longer hold more functions, you find a screen recorder with which to capture the Mac screen. to get lifetime free upgrades.